When you sip your morning cup of coffee or bite into an ice cream cone, do you feel sudden pain in your teeth? If tooth sensitivity is causing you to avoid your favorite foods and drinks, you are not alone. In fact, it is estimated that 3 million people a year are diagnosed with the condition known as dentin sensitivity. It typically occurs as you age because your enamel becomes thinner; however, it can develop in anyone. While it may seem like you have no choice but to live with the discomfort, you can get the relief you need with Lancaster dentistry. Using a simple treatment, you can help to strengthen the enamel, so you can enjoy your favorite foods again. Tooth sensitivity often occurs after certain dental treatments, like teeth whitening; however, the problem quickly subsides within a few days. For some, the issue may not be due to a recent dental treatment. Instead, it can be the result of weakened enamel. Your enamel is the hard-outer layer of your tooth, which protects the inner layer known as the dentin. The dentin contains tiny tubes that lead to the nerve center of the tooth, called the pulp. If the enamel becomes weakened, it causes the dentin to become exposed, leading to sensitivity when eating or drinking something that is hot or cold. In some cases, the sensitivity can even occur when inhaling cold air. No matter the cause, your dentist in Lancaster, TX has the solution you need to stop the pain. How Can I Stop the Sensitivity? Combating tooth sensitivity is often as simple as a fluoride treatment from your dentist. Fluoride is known as “Nature’s Cavity Fighter.” It naturally restores and strengthens the enamel to protect the inner layers of the tooth. Your dentist can provide you with a fluoride treatment, which involves painting the teeth with a special varnish. This will help to replenish any demineralization that has occurred while protecting your remaining enamel. The treatment is painless and can be performed in just a few minutes. In addition to a fluoride varnish, your dentist many also recommend the use of desensitizing products, which also contain fluoride. They coat your teeth while stopping pain sensations by blocking the nerve endings in the exposed dentin. If you miss drinking your morning cup of coffee due to tooth sensitivity, you can get the relief you need with a fluoride treatment. Call your dentist today to stop living with the pain. Dr. Mahima Gupta is a trusted dentist in the area for complete dental care. Supported by a diverse background, she provides personalized solutions to promote your oral health and quality of life. 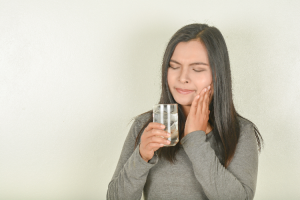 If you are living with tooth sensitivity, ask her how a fluoride treatment can provide you with relief at your next appointment for a cleaning and checkup.